I saw this on Shelfari this morning and it piqued my interest...what do you think? It could be I'm in the mood for creepy since finishing In the Belly of Jonah by Sandra Brannen (review coming later today). Published by AmazonCrossing in December 2010. I don't know much about this imprint, but it seems pretty interesting - their vision is to take the books that are popular in other countries, but are sometimes never translated into English, and actually translate them for English readers. Are you guys familiar with this? i think it might only be available for e-reading. 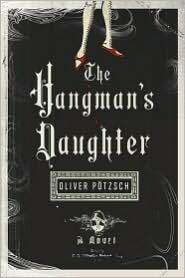 From Shelfari: A brilliantly detailed, fast-paced historical thriller, "The Hangman’s Daughter" is the first novel from German television screenwriter Oliver Pötzsch, a descendent of the Kuisls, a famous Bavarian executioner clan. Children are being murdered and witchcraft is being blamed. Germany, 1660: When a dying boy is pulled from the river with a mark crudely tattooed on his shoulder, hangman Jakob Kuisl is called upon to investigate whether witchcraft is at play in his small Bavarian town. Whispers and dark memories of witch trials and the women burned at the stake just seventy years earlier still haunt the streets of Schongau. When more children disappear and an orphan boy is found dead—marked by the same tattoo—the mounting hysteria threatens to erupt into chaos. Before the unrest forces him to torture and execute the very woman who aided in the birth of his children, Jakob must unravel the truth. With the help of his clever daughter, Magdelena, and Simon, the university-educated son of the town’s physician, Jakob discovers that a devil is indeed loose in Schongau. But it may be too late to prevent bloodshed. Oh, I just saw this on Shelfari, too. I love a cover that makes me have to find out more about the book. A German historical fiction murder mystery with witchcraft involved may be a bit heavy (and odd) but I'm intrigued. I'm going to have to look into it. Sounds spooky and intriguing...I don't know anything about the Kuisis history so it would definitely be a thinker mystery for me...is it a whopper like The Historian? I saw this somewhere today too, but not on Shelfari, I thought. It looks interesting. I checked for you on the German amazon site (http://www.amazon.de/Die-Henkerstochter-Oliver-P%C3%B6tzsch/dp/3548268528) and there are 96 5-star reviews, 27 4-star and another 31 are 3-star or lower. So, quite a few (German) people seem to have enjoyed the book. And it must be quite popular there, too, because that's quite a lot of reviews, I'd think. I love an earie book every now and then too and I agree, this one does sound good! Oooh that does look good! I'll have to keep an eye out for that one. Isn't shelfari great? Love eerie. Love the cover. Onto my list it goes. Oooh, call me morbid, but this looks good. I'm on Shelfari too. J Ravey, I believe. What are you under? Ooh, this one sound deliciously creepy and good. I'm adding it to my wishlist now! I've never heard of AmazonCrossing either, but it seems like a great idea to translate popular foreign books. This one sounds fantastic. I've been wondering about this one too but I haven't seen any blog reviews yet. Interesting to hear that it got 95 5-star reviews in German Amazon though. That's definitely a good sign! Cool find! I totally dig the cover! Oh, yes, this one does definitely pique my interest, and it is strangely reminiscent of a book that I can't quite place right now. I would be interested in reading this one, as historical mysteries always enthrall me. Thanks for sharing this with us! Sounds scary and I like that ! This one sounds fantastic! I've been especially in the mood for this type of book lately. :) I'm especially interested in the cover of this one as well. Moody!